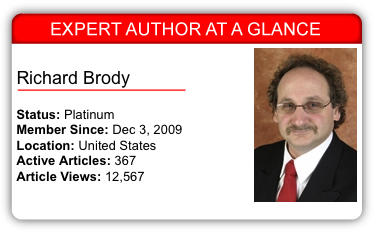 The 23rd edition in a series of posts that highlight one Expert Author who has achieved success by doing one thing exceptionally well. Richard’s background is far more diverse than most other people. He has worked as a financial planner, travel organizer, negotiator, conference and convention organizer, chief operating officer, director of development, supervisor and business owner. He’s also had a book and numerous articles published on natural medicine, and given numerous seminars on technical issues, as well as self improvement areas. Richard takes advantage of any technological shortcuts that he feels will ramp up his article writing and marketing efforts. When he finds new shortcuts, he tests them out and checks on whether they improve his efficiency. And he continues to search for more shortcuts when he has time. Leave a comment to to let Richard know he gave you a new way to look at article writing and marketing, or share your own technological shortcuts. Richard, when I was a newbie I wrote on everything, then I graduated to one or two niches. You provide good advice. I do a lot of what you do. On writters block I use the templates developed by EzineArticles and article alerts from Google on my topic. In technical I also use Dragon Speak to dictate my articles to the computer. Way to intrance is great. But more important is to give new way to new world. With a background like that, I’m surprised it’s possible to get writer’s block! :) I know how that goes, and for me, the news is a great inspiration for finding things to write about as well. Thanks for the tips, they are great. It made me realise there is an unlimited supply of subjects to wrtie about. This blog definitely has some useful tips, and this is how I’ve utilized them. It should be noted I’ve been using these tips in my article writing, even before reading this blog. On Style: I agree about writing on topics that interest you. Likewise, I’ve never used the title suggestions for ideas to write about since they seem too artificial and keyword optimized (which may be a problem with articles getting noticed in search results). Regardless, I create my article titles based on the content of the article, and not the other way around. On Inspiration: Each person has a wealth of ideas to write about based on their own experiences. Many articles are written simply because a thought I may have had which then quickly expands to an article, or even better a series of articles. The best articles have a personal touch or perspective. On writers block: When I get to the end of a string of articles and another topic doesn’t immediately come to mind, I browse the internet or other sources for ideas I may not yet have thought about. If I can come up with a few points of interest it can turbo-charge my writing. Regardless of what I write about, I always try to make an effort to make the perspective my own without simple regurgitating someone else’s content.